This isn’t just any wall. It’s a new way to build homes and buildings, one that increases the durability and longevity of a house, and makes economic sense for both builders and owners. It’s the HP+™ Wall System. Structurally stronger than using OSB and 2 X 6 studs. High Performance and High Effective R Values. 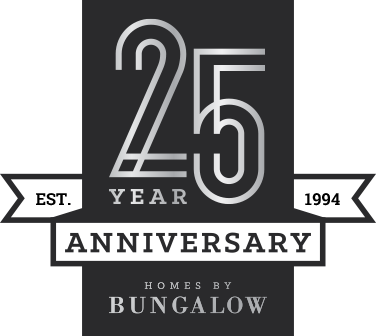 Eliminate wood OSB sheathing (E & XR). 3rd Party Engineer Tested and Verified. Compliant with current and future codes. Cost Competitive to traditional construction methods. 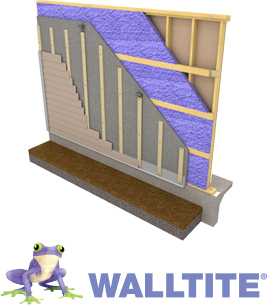 When you’re choosing insulation, make the right choice: WALLTITE®, the purple insulation. The insulation that pays you back. WALLTITE is Ecologo certified, a widely recognized multi-attribute environmental certification. Prevents infiltration of pollutants, allergen’s and toxins from outside the home by creating an air tight seal to your building envelope. Prevents growth of mold and fungi by controlling movement of moisture through the building envelope and eliminating condensation on surfaces. Meets the strict requirements of GREENGUARD and GREENGUARD GOLD certifications ensuring optimal occupant health, comfort and safety. Increases structural strength of your home’s walls. 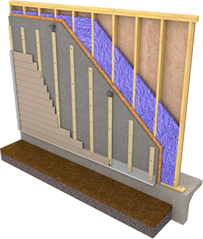 WALLTITE is 3 products in one – your insulation, air barrier and vapour barrier.